Budget is not a limit! Until recently, the use of virtual studio technology was available only for big TV stations due to high price of this kind of solutions. Along with development of computers and digital image processing techniques, such solutions are becoming more and more common. Nowadays, they can be used not only by the big TV stations, but also by local stations, educational institutions, organizations or companies. They allow you to create educational programs and they can be used for product presentations, preparing staff trainings, promotional materials, etc. And to meet the needs of this market sector, the RECKEEN LITE product has been developed. It is characterized by a very good price-performance ratio, while taking advantage of a user-friendly interface. As a result, even for an average operator it is very easy to learn. Production, that is the main module of RECKEEN LITE system, is a typical production application. Its primary task is to provide on operator with all the tools needed for live program production. This type of realizations require simultaneous operation on multiple video sources. To make this possible, RECKEEN LITE system allows you to receive external signal sources connected to the input card. Additionally, it generates multiple signal sources from the files on your hard drive, played by a system of virtual players. To control the players a simple interface is used – Media Tray. RECKEEN LITE system, depending on its configuration, enables operating on up to four sources (CAM1 – CAM4). CAM sources are streamed live, for example from a camera connected to the input card. RECKEEN LITE has also NDI signal sources. Remaining signal sources are played by virtual players. The players support the following sources: MEDIA1, MEDIA2 for movies, STILL1, STILL2 for static graphics, and Text1, Text2 for text boards. 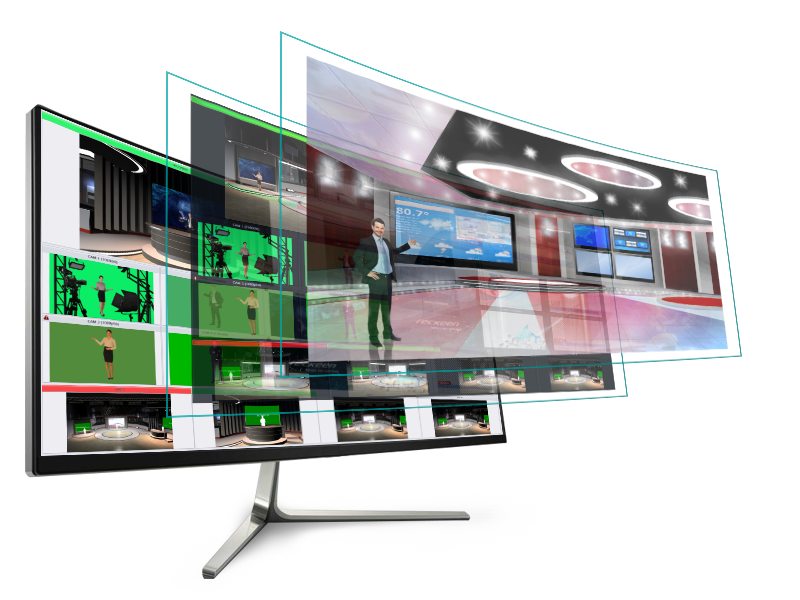 RECKEEN LITE system gives the operator as much as 14 simultaneous previews, enabling efficient realization of the live program. 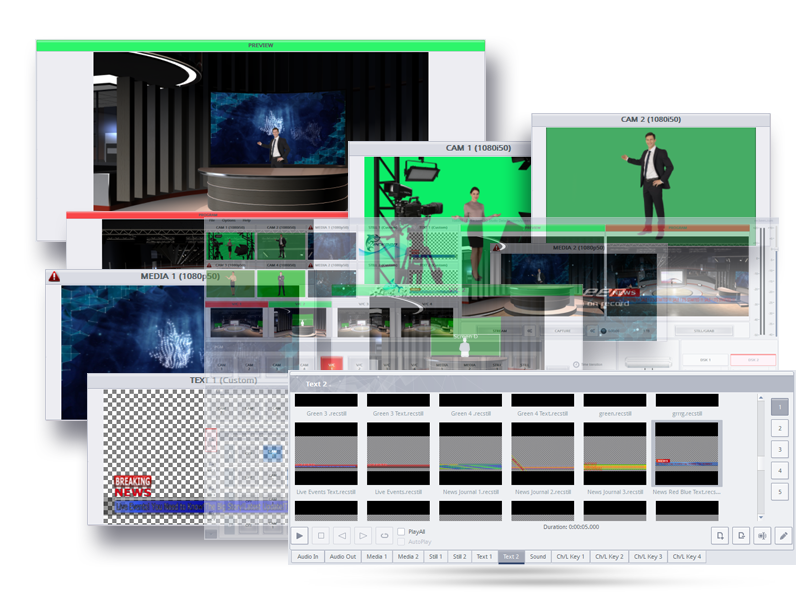 Given their functions, previews can be divided into three groups: previews of input signals, production previews, previews of virtual studio shots. Previews are generated in real time providing the operator with full view of the realized program. All previews are displayed on production application’s screen. To ensure complete comfort of the work, previews can be displayed on additional monitors. 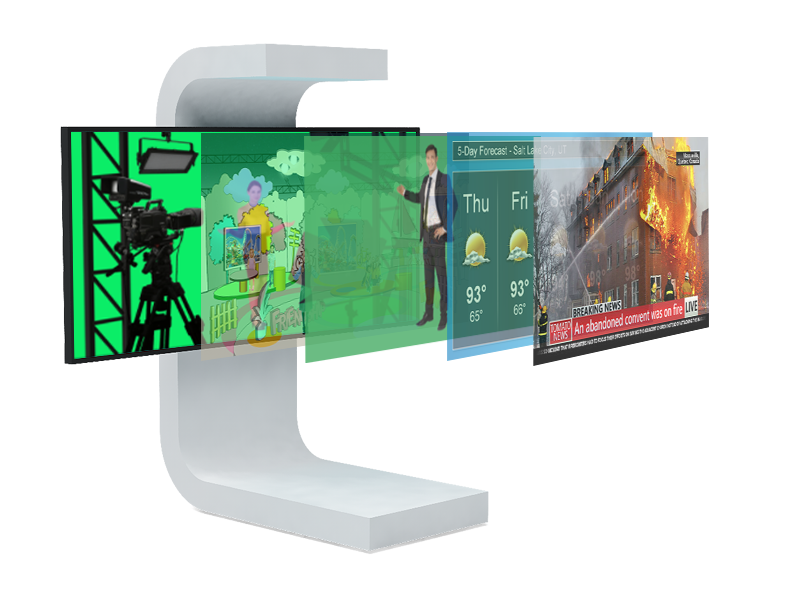 The system can support up to three monitors displaying additional previews in various combinations. Keying is a special kind of filter that in RECKEEN LITE system can only be used for camera inputs. It removes image areas of a specific color (e.g. green) – after you turn the keying on and set its parameters, the green color is deleted. The figure of a presenter, filmed on a green background, can then be placed on any virtual scenery. RECKEEN LITE system is equipped with an advanced chroma key algorithm, realized through the GPU using the shaders technique. It allows you to enjoy the high quality of keying effect for both green and blue backgrounds. 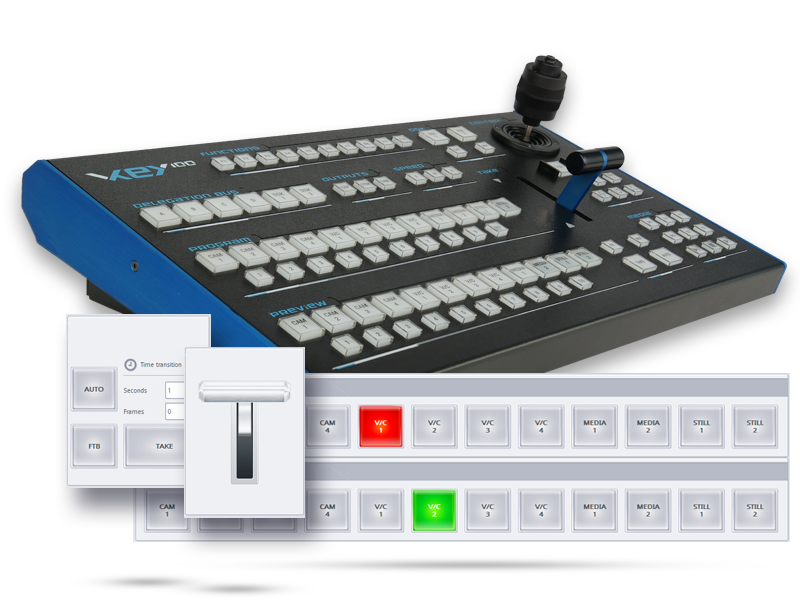 The key can operate in either luminance (luma-keying) or chrominance (chroma-keying) mode. Setting parameters of the key is done in six easy steps, through which a special setup wizard leads you. With this solution, even the less experienced user can choose the optimal key parameters. The achieved results are impressive. No broadcasted program can do without graphics and boards with captions. Graphics and boards are placed on the main signal as overlays. Customarily, this type of overlays are called DSK (downstream key). RECKEEN LITE system allows you to add up to two DSK signals simultaneously. Any virtual player can be a signal source for DSK, which makes it possible to use any media available in production application. Typically, boards with text, static graphics or short computer animations are placed on DSK layers. For their preparation, movie and image formats should be used. They must also have a definition of transparency, the alpha channel. RECKEEN LITE system has its own text boards editor, which makes it really easy to prepare captions for future use on DSK layers. 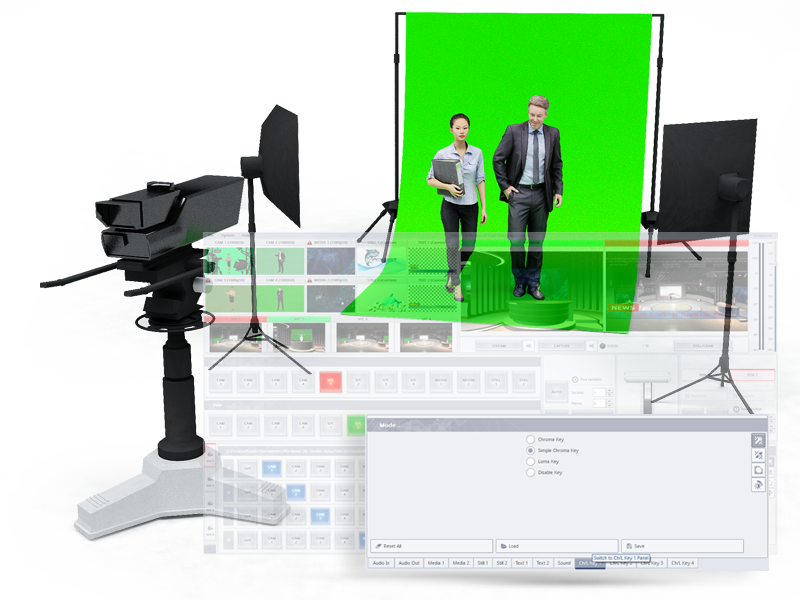 While working with a virtual studio and producing a program, you have a MultiViewer module available. In addition to the available previews of material being prepared (PRV), as well as one being broadcasted (PRG), you can view and configure the media tray. This function allows you to choose graphic and video content to which access should be quick and easy. The MultiViewer panel may contain: a preview of each of the available virtual cameras’ settings (up to 4 independent cameras), up to two text panels configured with the Still Editor module, up to two static graphic panels in .jpg, .png, or .bmp format (more information on the technical specifications can be found here), up to two video sources from the local disk in avi, mpg, mpeg, mp4, mov or mxf format encoded with MPEG2, MPEG4 or H.264 (more information on the technical specifications can be found here). 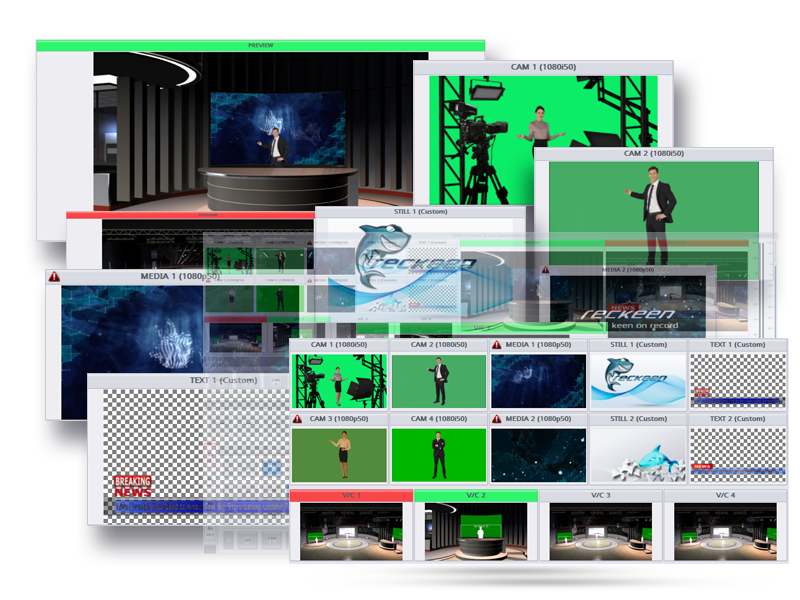 At any time, each of the selected media types can be displayed in the active areas defined in the virtual studio structure and its properties can be modified. MultiViewer panel also allows you to control additional functions of the broadcasted content, like streaming your program to video sharing sites – YouTube, Facebook, NicoNico, Ustream or other use-selected ones, recording your content on the disk, saving snapshots to the disk (in the form of graphic files) and controlling a volume of a main audio output. Virtual SETs contain studio decorations and settings for placing the presenter and virtual screens into a video footage. Typically, each set includes several different shots of the same studio. You can load specific shots into four RECKEEN LITE system trays, which gives you a possibility to change between the takes of the studio quickly, giving an impression that every shot comes from a different camera set in this studio. 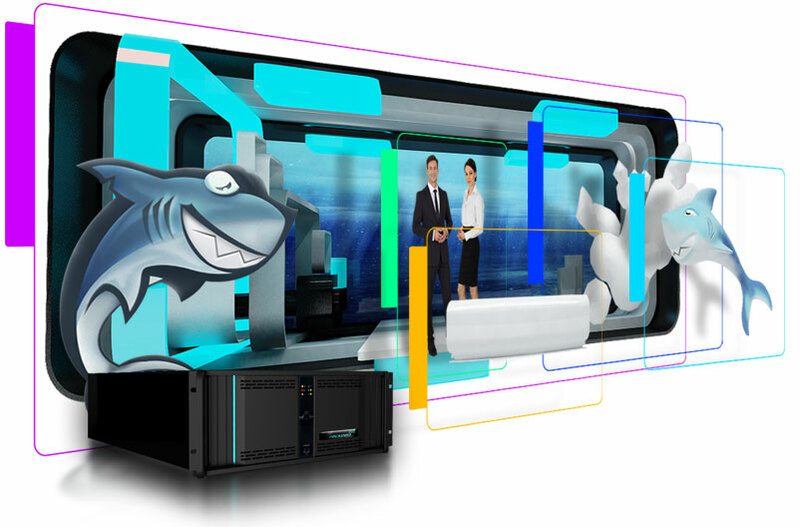 Together with RECKEEN LITE system there comes a set of 30 professionally prepared virtual studio SETs with different themes, like news, talk shows, education, children’s programs, or fairy-tale scenes. The uploaded virtual studio compositions need to be configured when preparing the broadcast. The first step in such configuration is selecting the signal sources that will be used in the studio. Afterwards, on a background of the studio decoration a figure of presenter will appear, and on virtual screens, for example, a movie will be displayed. If such need arises, you can adjust the figure of the presenter to match the applied stage design by correcting the scale (size) and position of the figure against the studio background. On such created studio image, you can define movements of a virtual camera. For each studio, three phases of camera movement can be defined enabling movement of the camera from one position to another. During the broadcast, the position of the camera can either be switched without animation or smooth runs can be created – with animation of a definite duration. 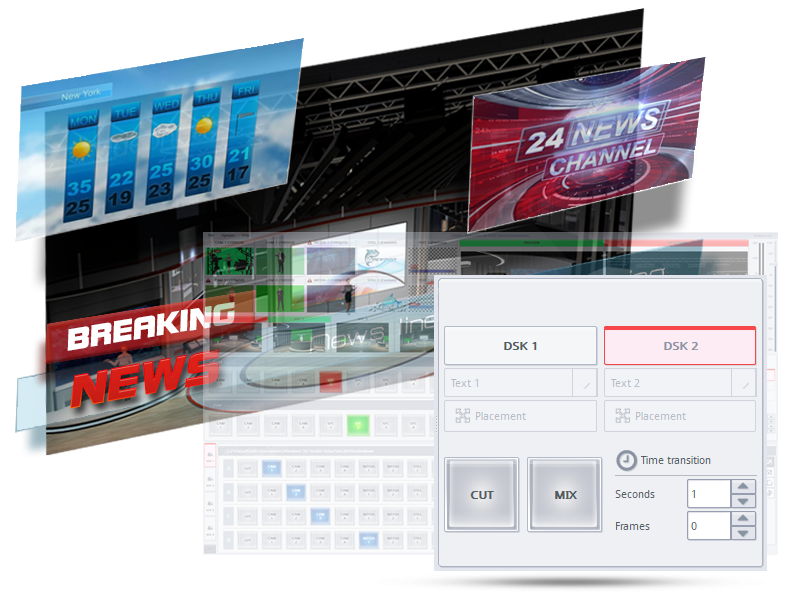 Media Tray is a user-friendly interface that gathers in one place all the media you need to broadcast the program. 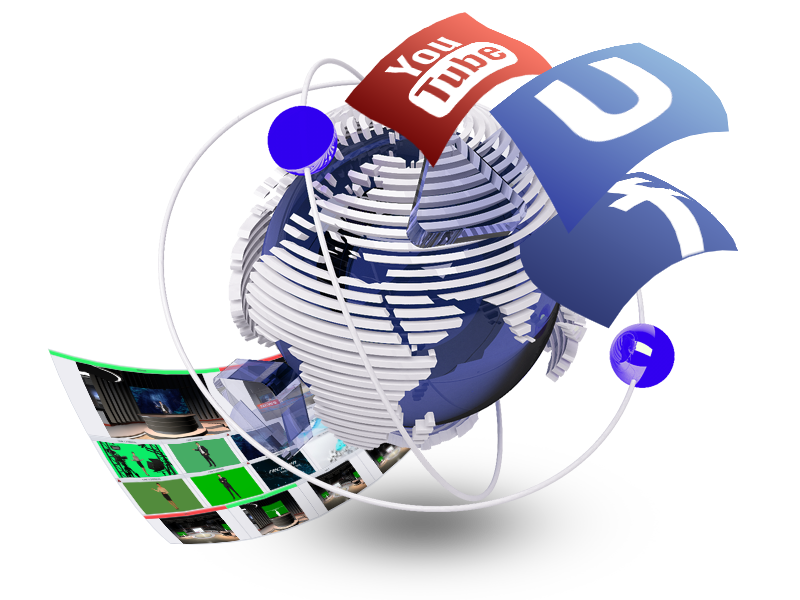 Media can be transferred from a tray to virtual players, or used for the broadcast or as sources in virtual studios. RECKEEN LITE system has 6 trays for different types of media and the following media can be used: movies, static images, and text boards. Using media in the program is very simple. You just have to add a file to a proper tray and load the media into a virtual player. RECKEEN LITE system has a sound mixer feature that allows you to mix the audio signals. 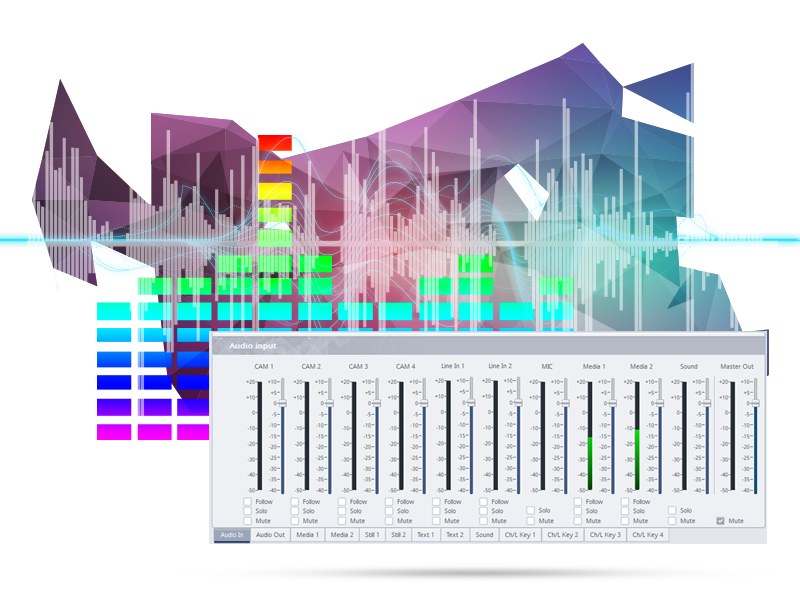 Mixer function supports both internal and external audio sources. In the audio mixer, each input has a separate slider for adjusting this input’s signal level. These are: Line In 1, Line In 2, CAM1, CAM2, CAM3, CAM4, MIC, Media 1, Media 2, and Sound. For each channel, you can completely mute the signal (MUTE) or play a single signal (SOLO) to the output. This function allows you to capture individual video frames with possibility to save them to a file (PNG). Depending on Production switcher settings, it is possible to capture frames from a live broadcast or from the media transmitted to the broadcasting output. A file with the captured frame is automatically saved to your hard drive. A shortcut to this file is added to the Media tray (Still 1 or Still 2). As a result, immediately after the frame is captured, it is ready to be used directly on air or as one of the sources for live program being created. 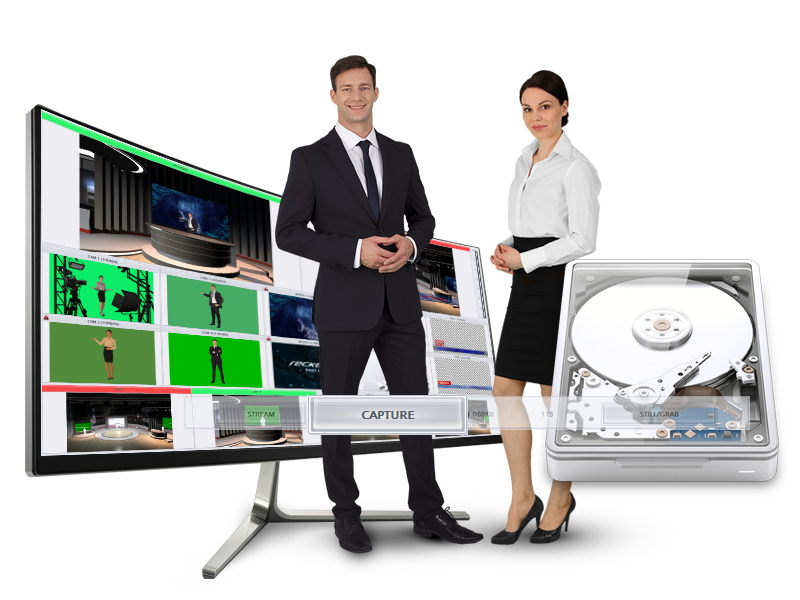 Capture function allows you to use RECKEEN LITE system as a Video Recorder. The entire program broadcasted on the air can be simultaneously saved in a file on the hard drive. MP4 file format with h264compression or MPEG-2 is used. The resolution and the frame rate depends on the mode in which the system output operates. The size of created files can be adjusted by choosing the compression ratio. RECKEEN LITE system’s streaming feature allows you to send broadcasted signal in the form of the Internet data stream. With this feature, your live broadcast immediately reaches to all its viewers, even in remote locations all over the world. RECKEEN LITE system is a key element for realizations of this type, since it not only creates a broadcast signal, but also makes this signal available in the form of a data stream. Through appropriate software, the stream can be uploaded to a server that realizes a broadcast streaming function e.g. YouTube, Facebook, Livestream etc. The server allows you to make the signal available to many viewers at the same time. You can watch such broadcast on any device with a web browser, like PC or tablet. 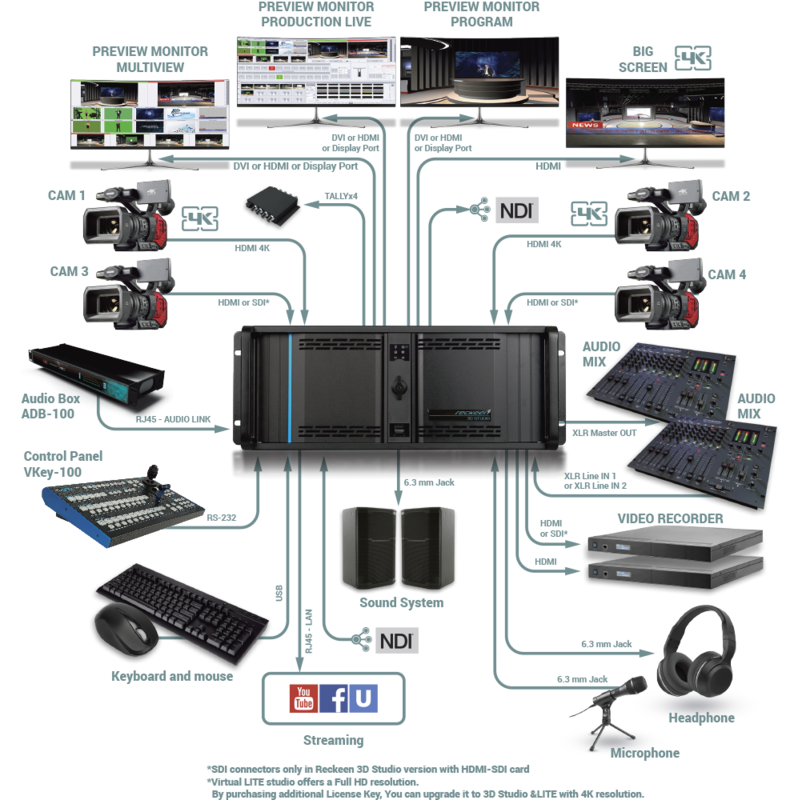 Full support for the production process RECKEEN Lite system, with its comprehensive set of functionalities, supports a complete production cycle of a TV program or a video content. Quick access to functionalities, user-friendly interface, compatibility with external devices and efficient hardware allow you to carry out even the most ambitious projects.